When the U.S. Supreme Court struck down a key part of the Voting Rights Act last June, justices left it to Congress to decide how to fix the law. But while Congress deliberates, activists are turning again to the courts: At least 10 lawsuits have the potential to bring states and some local jurisdictions back under federal oversight – essentially doing an end-run around the Supreme Court’s ruling. 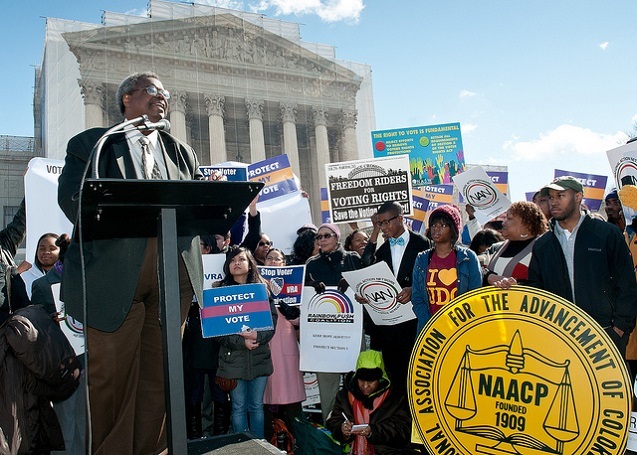 A quick refresher: The Voting Rights Act outlaws racial discrimination against voters. But the law’s real strength comes from its “preclearance” provision, which forces jurisdictions with a history of racial discrimination to submit new voting measures to the federal government for approval. In last summer’s Shelby County v. Holder ruling, the Supreme Court threw out the part of the law that spelled out when states were automatically subject to federal oversight. States that have been released from preclearance have already passed a rash of new restrictive voting measures, as ProPublica reported earlier. Enter the lawsuits, which hinge on a different part of the Voting Rights Act, the so-called “bail-in” provision. It lets federal courts impose preclearance if a state or local jurisdiction violates the Constitution’s 14th or 15th amendments, which guarantee equal protection and the right to vote. While the “bail-in” provision has emerged as the new tool of choice for voting rights activists, it is not as sweeping a remedy as the oversight authority the Supreme Court dismantled. Before the ruling, states, counties and other jurisdictions that were subject to preclearance had to get every single voting change approved – whether they wanted to require a photo ID to vote, change voting hours on Election Day or move even a single polling place. Under “bail-in,” the court can tailor oversight to the situation. A state that enacts an unfair redistricting map, for example, may only need to submit its next map for federal approval. To prevail in court, plaintiffs must prove a jurisdiction intentionally crafted laws or rules to discriminate against minorities. Although that’s not an easy standard to meet, it’s been done before: In the nearly 50 years before Shelby County v. Holder, courts imposed federal oversight requirements at least 18 times after finding that minority rights had been violated. So far, the Justice Department has joined two lawsuits against Texas and has launched its own case against North Carolina. Following is a rundown on all the lawsuits, and an update on the effort in Congress to amend the Voting Rights Act after last year’s court ruling. Michael Li, a Dallas election law lawyer who runs a blog that exhaustively tracks Texas election news, thinks “there’s a decent chance” Texas will be put under federal supervision— since a federal court already ruled that the state’s Congressional and state Senate redistricting maps were intentionally discriminatory. But ultimately, he expects the question will be kicked up to the U.S. Supreme Court. Perez et al. v. Perry et al. : Hispanics accounted for 65 percent of population growth between 2000 and 2010 in Texas. But when the Republican-led legislature drew congressional boundaries after the 2010 census, a federal court found that the maps favored white Republican incumbents and had a “discriminatory intent.” After Shelby County v. Holder, Texas said it would use the contested maps anyway. A coalition of voting rights advocates has asked the court to put Texas back under supervision, and the Justice Department joined in. Veasey et al. v. Perry et al. : The day the Supreme Court freed Texas from federal oversight, Gov. Rick Perry announced his intent to enact a photo ID law that the Justice Department and a federal court had refused to approve. Rep. Marc Veasey, D-Texas, sued the next day. Veasey and supporters – including the League of United Latin American Citizens and Dallas County – say the law discriminates against minority voters, who, by the state’s own admission, are less likely to possess an eligible ID. The plaintiffs want to put the entire state back under preclearance, and the Justice Department’s photo ID lawsuit was merged with this case. Petteway et al. v. Galveston County: Five local elected officials, led by Constable Terry Petteway, sued Galveston County, arguing that the county gerrymandered their districts to discriminate against Latino and African-American candidates. The officials have asked a federal court to throw out the map and put Galveston County back under federal oversight. Cantue et al. v. Beaumont Independent School District: This case targets a school district. After years of legal battles over voting maps, a group of Beaumont citizens who believe the district has discriminated against black voters want preclearance of all election changes. Almost two months after the Shelby County v. Holder ruling, North Carolina passed a bill that requires voters to show photo ID, shortens the early voting period, eliminates same-day registration and instructs election officials to throw out any ballots cast in the wrong precinct, among other restrictions. Now three different lawsuits ask to put North Carolina back under preclearance. North Carolina State Conference of the NAACP et al. v. McCrory et al. : The plaintiffs say the law discriminates against African-American voters, who are less likely to have a photo ID, more likely to vote earlyand who historically have cast more out-of-precinct ballots. League of Women Voters et al. v. North Carolina et al. : The League of Women Voters is particularly concerned about the law’s early voting restrictions. The complaint says that in 2012, almost 20 percent of the electorate cast ballots during the early voting days that the legislature eliminated in 2013. The League contends that shortening the early voting period unfairly burdens poor and minority voters and will increase waiting times for all. U.S. v. North Carolina et al. 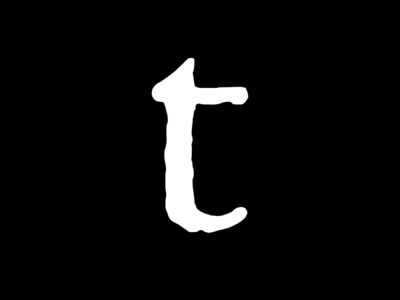 : In September, the Justice Department filed its own lawsuit. The complaint notes that from 1980 to 2013, the Justice Department objected to 60 of the 155 voting changes that North Carolina submitted for preclearance. Terrebonne Parish Branch NAACP et al. v. Jindal et al. : Five judges on the 32nd Judicial District Court are elected at-large by majority vote. A black candidate has never won. Now, the Terrebonne Parish Branch NAACP argues that the at-large scheme dilutes the black vote and that racial discrimination continues to the current day. As an example, the plaintiffs assert that in 2004, a sitting judge was suspended for attending a Halloween party dressed in blackface and an orange prison jumpsuit – only to be re-elected in 2008. The plaintiffs ask the court to require preclearance for the 32nd Judicial District. Toyukuk et al. v. Treadwell et al. : In 1975, Congress expanded the Voting Rights Act’s coverage formula to include places that offered English-only election materials when at least 5 percent of voting-age citizens spoke a different language. Now, a group of Native Americans says Alaska failed to provide voting materials and voting assistance in their native language Yup’ik and its dialect Cup’ik. The group wants the Justice Department to oversee language assistance procedures in the Dillingham and Wade Hampton census areas. Jackson et al. v. Wolf Point et al. : Since Shelby County v. Holder, voting rights advocates have tried to sanction one jurisdiction that has never been under federal oversight – a school district in Montana. Voters in Wolf Point School District 45A say that the county superintendent’s office packed Native Americans into one malapportioned district to dilute their vote. They ask a federal judge to force the school district to create a new redistricting plan and require that the school district submit its 2020 redistricting plan to the Justice Department for approval. State and local governments that had literacy tests and low voter turnout in the 1964, 1968 or 1972 presidential elections had to submit all new voting changes for federal approval. Jurisdictions could be released from oversight after 10 years without problems. As of June 2013, these areas were still subject to preclearance. Plaintiffs have asked federal courts to impose Justice Department oversight on two states and six local jurisdictions. 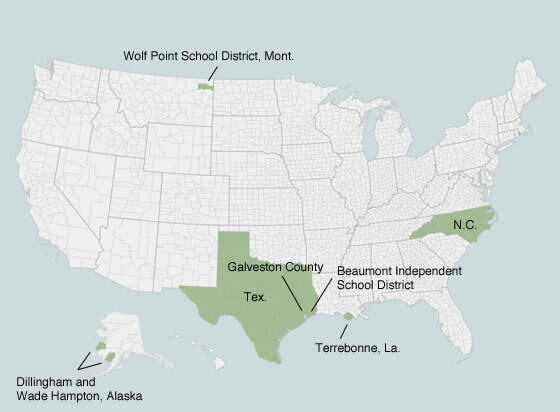 Texas is home to four lawsuits – two against the state and others against Galveston County and the Beaumont Independent School District. Under bills in the House and Senate to amend the Voting Rights Act, four states and two counties would face federal oversight because they’ve committed too many “voting rights violations” over the past 15 years. While the lawsuits play out in the states, Congress is considering a new proposal to rewrite the Voting Rights Act provisions that trigger federal oversight. Legislation in both the House and Senate would make it easier to “bail-in” new states: Courts could institute preclearance if a jurisdiction violated any federal prohibition on voting discrimination, not just the Constitution. That way, plaintiffs would not have to prove the discrimination was intentional. In addition, the bills would change which states are automatically subject to federal oversight. States that are sanctioned for five “voting rights violations” in 15 years would need to submit new voting measures for federal approval. “Voting rights violations” would include any time a voting measure violates the 14th or 15th amendments or Voting Rights Act, and any time the Justice Department or a federal court rejects a voting measure that had been submitted for preclearance. The new formula would also cover counties, townships and other political subdivisions that have three violations over the 15 years, or just one violation combined with consistently low minority turnout. 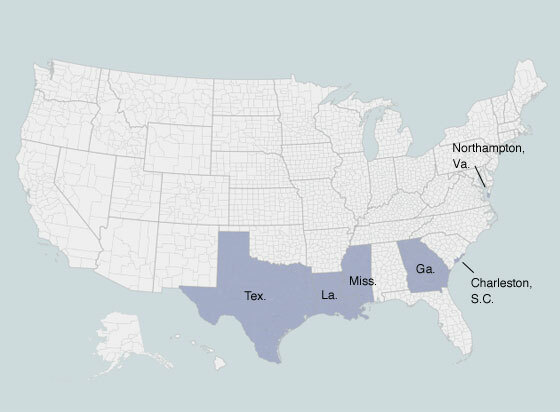 Under those criteria, four states and two counties would be subject to preclearance today: Texas, Louisiana, Mississippi, Georgia, Charleston County, S.C., and Northampton County, Va.
Kara Brandeisky is a reporting intern at ProPublica. She previously interned at NPR, Slate, Congressional Quarterly, The New Yorker Washington bureau and The New Republic. She graduated from Georgetown University with a degree in Government.